Royal Mail account holders were told not to write about this stamp issue, especially on social media, until Royal Mail had made the official announcement, but as the stamps are on their website and the artist Malcolm Tween and others have already spread the word on twitter, I feel no need to hold back giving you the news that there is to be yet another Star Wars stamp issue on 12 October. Don't get me wrong, I don't think this is a good move for the stamp collecting hobby in this country (although a lot of money will flow into Royal Mail Stamps & Collectibles which will be useful for them) but a lot of people commenting seem to have short memories, suggesting that this is not a British enterprise. I suggest you have a look at the paragraphs on our 2015 webpage about the earlier issue to jog your memories. The new stamps feature a mixture of old and new characters - Prog, Chewbacca, Maz Kanata, C3PO, R2D2, BB8, K-250 and Supreme Leader Snoke. 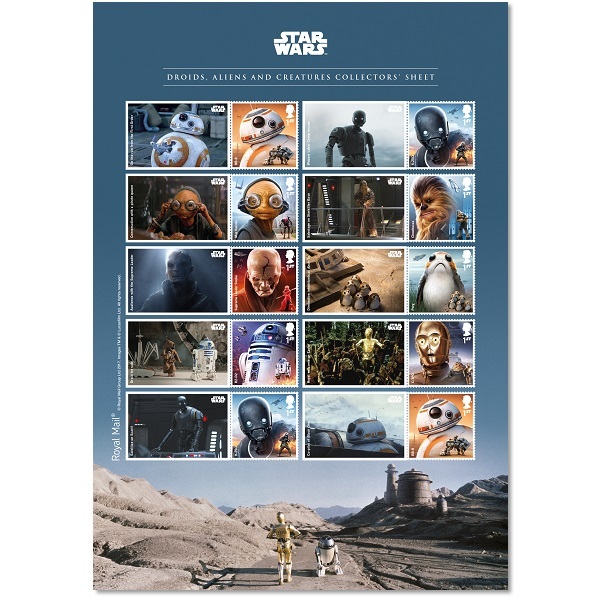 Available to pre-order on the Royal Mail website some products are aimed squarely at Star Wars fans, some are for normal postal use (8x 1st class shown above), while some are aimed at the philatelic community. As well as the usual framed and bemedalled paraphernalia there is a prestige stamp book* (and a limited edition ditto) issued on 14 December when the next new film is released, and two retail stamp books issued in October. Whilst the latter should not bring any new definitives, only four self-adhesive versions of what will probably be a gummed set of 8), the PSB will contain 4 x 1st class, 2 x 2nd class and 2 x £1.05 £1.40 Machin definitives which should be coded M17L MPIL. This will give us three new stamps in the pane of 8. There doesn't appear to be a new Smiler sheet this year, although the sales pages of Royal Mail's website show a mix of new and 2015 stamps and may require closer examination. Thanks to Anonymous for his closer examination of the website! He has found the two new generic sheets. The Droids Aliens and Creatures generic sheet of 10 with attached labels has the 8 new stamps, and two extras and is priced at £7.00 (face value £6.50). The Ultimate Collectors Sheet (which must mean that it is the last of these?) shows all 20 stamps and is priced at the £13.00 face value. This one could be gummed, whilst the one above would most likely be self-adhesive. Time will tell. The stamps from this one are also available on an A4 first day cover at £17.50, the like of which we have not seen since the Classic Album Covers sheet. ... have already announced some stamps, including Portugal, which has two each at €0,50 €0,80 and €0,85 and a miniature sheet with 3 x €0.50 sold at face value (allthough a souvenir colder costs more). When I first saw this here I thought it was a good pre-April Fool's Day joke. I guess it isn't. The first Star Wars issue was just about justifiable as it ostensibly celebrated the great British contribution to the movies but I see no mention of that here. No doubt the issue will be a money spinner but it's so undignified. One month Royal Mail is commemorating First World War I heroes and the next month silly-looking fictional American movie creatures. Such issues cheapen those stamps which commemorate those who have made great contributions to our country. From the RM page - "Beautifully illustrated by UK digital artist, Malcolm Tween, some of the stamps feature secret details, revealed only by UV light." Does that still correspond to any postal rate? I though that rate went up to £1.17 earlier this year. My mistake, it's £1.40. It was a small image and I had forgotten that the £1.40 was a similar colour to the £1.05. That's got to be a new record high value for a PSB definitive, though, hasn't it? 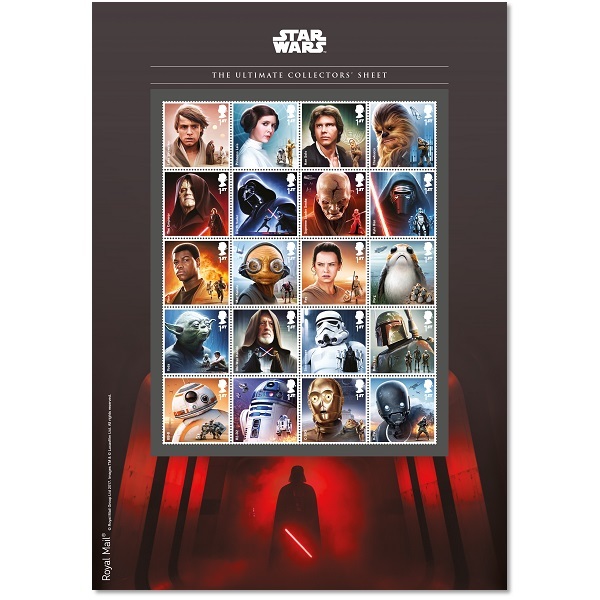 Royal Mail have found a real cash cow with Star Wars stamps and my God, aren't they taking full advantage! What happened to originality? On a side note note, the portugease stamps are better in my opinion. Two Collectors/Smilers Sheets, one replicating the previous issue but with the new stamps, and one with one of each of all 20 of the 2015 and 2017 characters stamps. Thank you: we've now had updated info from Tallents House as well. 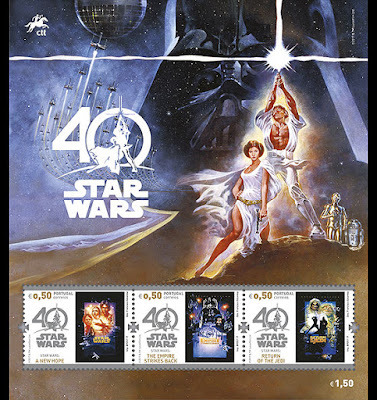 Collectors' Sheets for Star Wars fans / memorabilia collectors - ok. PSBs for serious stamp collectors with no interest whatsoever in this foreign film franchise - no thanks. Words fail me ... It was bad enough last time, but this is beyond a joke! 8 stamps, 2 PSBs (one £75! ), 2 collectors sheets and 2 retail booklets! STOP! Please, just STOP! Surely they could have found a better subject. This so soon after the last Star Wars issue. Talk about duplication. Still at least I can save my money for the next Royal Mail extravaganza. Lets hope they pick a British subject and not more of this dribble. Look at all the sporting achievements we have had this year, yet not a stamp in sight. Good news for Machin collectors 3 new definitives. The 1st class with date code M17L and source letter code P was issued back in June in the Machin 50th Anniversary Prestige stamp book so this one could be the same but does depend who printed it. However, it will still be a new source for this stamp. But this one will be the darker colour: the Machin anniversary stamp was the old red/vermillion (depending on which term you use). This should be bright/deep scarlet (ditto). Honestly I like these stamps and they will, even if similar to a previous issue, attract the attention of non-collectors. I think 2017 has actually been quite a good year for stamp designs - there have been several sets with creative artwork, a good set of stamps that actually commemorate sites outside London and the south East (and the first commemorative stamp with a location in Kirkcudbrightshire (my home county)) There have been a few misses - especially the 65th anniversary of the Queen's Accession and the second of the two machin minisheets. There is obviously still a question of quantity and whether the right anniversaries are being selected but I honestly feel that there has been something for everyone this year and I have enjoyed getting good responses from the mail I send to friends using these stamps. As regards the PSBs, commemorative sheets etc.I don't buy anything but a single set of mint stamps in the form of a presentation (for my collection) and sheet stamps for normal mail so I haven't found the cost too excessive - equivalent to a cup of coffee per week on average. I know I am in the minority with these opinions though! I too compare things to the price of a cup of coffee (from the big chains) and find letter writing quite reasonable. I'm pleased you use nice stamps on normal mail too. Although I can't see these stamps used on all types of mail (good thing I had a good choice of stamps for my mother to pick from to send a sympathy card - Mr Grumpy wouldn't have been suitable). Now I have a printer, I really should get round to printing a picture of some of these wonderful stamps on those iron-on transfer paper, with a slogan (unsure of exact wording) - "Do you think I want a book of plain stamps when THESE are available?" Stamps should be for everyone, not just the collector. It will be good to see these used on mail. I did a trawl through anniversaries for a few years back when I sent in by mail some suggestions to Royal Mail (can't recall the address), but none of them was taken up. An Post (Ireland) happily ask for suggestions. Let's hope they take on the suggestions from the survey earlier this year for 2019. I'm not a collector (pause for some of you to recover from the shock). I am a letter-writer though, and I like to use interesting stamps - preferably ones that the recipient will find amusing or appropriate. So I buy mint commemoratives on eBay - setting myself a maximum bid price (including postage) of 2/3 face value. And this works. Which probably means that some sellers who bought them as an investment are losing out. Or collectors/dealers are taking a loss on some and winning on others. The catch is - I have to wait a couple of years after issue. As soon as a prominent issue appears - Dr Who 50th Anniversary, Harry Potter, Star Wars 2015 or the Music Giants - eBay is flooded with sellers who have pre-ordered and hope to make a quick profit. Some will - because casual buyers will pay over the odds when they find out they couldn't just wander up to a PO and have a choice and others will think they can sell on themselves in a couple of years for a profit. I didn't buy Star Wars 2015 - I'm still seeing sellers asking £1.50 for a single stamp on eBay. Not sure how many of those are actually selling yet. Possibly when the new set appears - the older ones will come down in price. There are some disreputable sellers on ebay selling used but unmarked stamps (and these are illegal to use). There is a nice stamp dealer in Galashiels sells mint gummed / still with backing if self-adhesive stamps, and if you go for mixed pack, some stamps could be from the 70s, some could be a lot newer but you can also pick stamps of the values you want. I have bought a couple of presentation packs from charity shops for less than face value. I look at every individual item as an investment.Commemoratives is not one of them.These are nothing but cartoon type stamps.Soon you will see RM cover cut up and the used strip sold for £1 at stamp fairs.My advice collect if you like them. But for investment take your money elsewhere. I just find this set a tad too much after the last issue 2 years ago, there will probably be another small set in two years time, when the last Star Wars movie gets released. Overall 2017 have been a great year, apart from the Medieval Britain set at the beginning of the year, if I remember right there is a second set next year to Medieval Britain, and probably celebrating 250 years anniversary of James Cook, along with the Commonwealth Games, maybe another set of Music Giants (George Michael). I must admit my favourite sets of the year has to be British Birds, Classic Toys, Windmills & Waterways and David Bowie. Had a Star Wars mail shot arrive from Royal Mail. I gave it to my Brother-in-law, who is a big fan. He liked the stamps and is going to frame the card. I think they are ok but do we need another set?. I'm not a big Star Wars fan, but did enjoy the filming of Star Wars 7, 3 miles from where I live in Berkshire. Most of the locals recognised the rebel base. 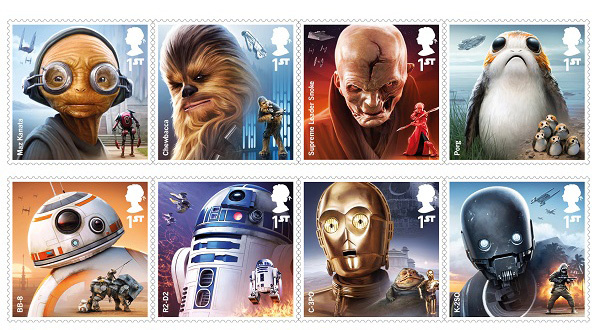 These new Star Wars stamps will have massive popular appeal, so it's not hard to see why Royal Mail will released them. I particularly like the composite sheet of 20, which will add a new variety to the series. The Star Wars set from 2015 was the reason for me to stop collecting current GB. Not interested in paying huge money just to be allowed to stick pretty pictures in a book. Way too many issues, with way too many stamps per issue, with way too many higher tariff stamps. If I pick up stamp collecting ever again, I will probably go back at least a century. It's nice for the general public that they're doing this, but I'm not forking out the cash anymore. I fully agree with your comment!